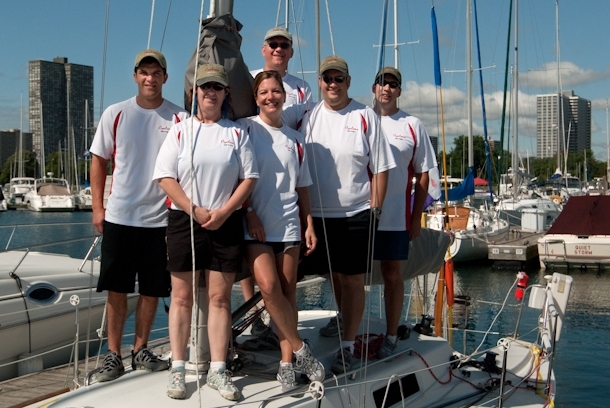 As many of you know, Cyclone is participating in the 2009 Chicago to Mackinac sailboat race, the world's longest annual freshwater sailing race. This year's race is the 101st running and 350 boats from around the world will be competing. The race starts this Saturday, July 18th, A boat parade will be going past the east end of Navy Pier starting at 10AM. The best place to watch is from the east end of the pier. There will be TV crews and an announcer talking about the boats. Look for "Cyclone" # 51804. We will be starting the race at 12:20PM about 1.5 miles east of the Chicago lighthouse. Cyclone will be equipped with a satellite tracking transponder. You can watch my team's progress on the web. Check out the links below. If it is an average race we should finish sometime Monday afternoon/ early evening. At 30 ft we are one of the smallest boats in the race (smallest is 28 ft) and the smallest boat in our section which is "Section 7". We will be in direct competition with boats up to 50 ft and with only six people on board we have one of the smallest crews. Feel free to cheer us on by keeping your browser on us. Q. If you guys are one of the smallest boats how can you guys win? A Boats are handicapped by a mathematical rating system (ORR) which predicts how fast they should be capable of sailing under a variety of conditions. Applying these ratings to each boat's elapsed time on the race course determines which boat sailed the best relative to their rating, and therefore determines the winner. This allows the entire fleet to compete against each other. We have just as much chance of winning as the 86 ft "Windquest". They might finish before us but after the handicap is applied we can correct on the bigger boats. Although we are one of the smallest we are somewhere in the middle for speed. Cyclone is a bit of a hot rod for its size. Q. Do you race at night? A. Yes the crew is divided into shifts, half of the crew is down below sleeping while the other half is sailing. If the on deck crew needs help they call "all hands on deck" for help. Q. What about food and water? A. We bring enough to last till Tuesday. Q. What if someone has to go to the bathroom? A. Cyclone has a head, know as a toilet to landlubbers. A. We race right through it and we have lots of required safety equipment in case something bad happens. Last year we spent eight hours in 25-30 mph winds with driving rain and lightning, at night. The worst part is if there is no wind, the flies can get very bad. Q. Is there a shower.? A. No, if you finish 25 Mac races you are called an "Island Goat" you can guess why they have that name. Q. How do you know how to get there? A. We have a GPS (Global Positioning System) that tells us where we are. Some boats sail north till they smell horse poop and fudge then turn right. Q. Does the Coast Guard know about this? A. Yes and they send the 245 ft ice breaker "USCG Mackinaw" to shadow the fleet. Q. What do the winners receive? A. The Chicago to Mackinac race is an amateur event, so no prize money is awarded. The section winners will receive a plaque, a flag, and bragging rights for the next year. The overall winners have their names engraved on the permanent trophies that are displayed at Chicago Yacht Club.